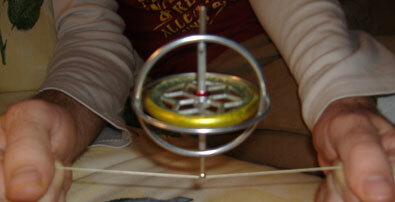 Ok, I admit, I asked for a gyroscope for Christmas. You know you’re a physics geek when… But it’s fun! Even my sister, whose middle name is “If you say anything about physics or computers or science of any kind I’m going to stop listening”, thought it was cool feeling it push you around and making it balance on things it shouldn’t be able to balance on. My hope is that with this as inspiration I’ll do much better in Classical Mechanics 2 than I did in the first installment.